Personnel flying offshore have to undertake sea survival training with a recognised provider. This report describes a research study to consider the physical demands of this training and the success rate of those completing it. The observations on each of the essential tasks are presented and conclusions drawn in respect of adequate training. 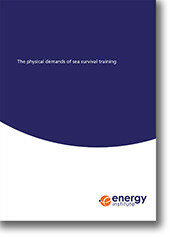 This publication will be of interest to training providers and international oil and gas operating companies sending personnel to offshore assets.